Why a bin might be better than a compost heap. A compost heap is just what it sounds like – a heap of compost that lies on the ground. You can turn it, aerate it, and add to it while it decomposes. The compost heap can at times be covered with a tarp in order to lock in heat and control moisture, or it can just sit there uncovered – decomposing away. Photo found on Flickr.com courtesy of Gillian. 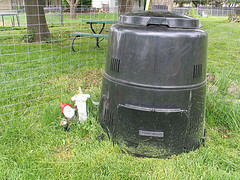 A compost bin is just that – a bin for your compost. These bins can come in varying systems – you can make them yourself, you can buy a wooden one, a multi-bin system, a rotating composter, a tumbling composter – you name it. The point is that these bins do not rest on the ground and are still holding cells for your compost. Photo found on Flickr.com courtesy of Randzig. So, those discrepancies pointed out, why might a bin be better than a heap? Well, first off…you should always check with your city to see if there is an ordinance prohibiting compost heaps. Some cities say the big nay-no to a compost heap. If your city says its okay and you have a homeowner’s association, you still may want to check with them. Let’s just say that some homeowner’s associations can be less than fond of a compost heap in the backyard. So, taking that into account, let’s also think about other possible benefits of a compost bin – they are often closed and above ground, which means they are resistant to being torn up by rodents and animals. Organic wasted confined to one part of the lawn is one thing – but decomposing material strewn about the entire lawn is a whole other story altogether. Compost bins are also convenient. You can carry waste to the bin, close a lid and tumble it (if it’s a tumbling composter) or spread it around (with a compost turner or a compost fork). 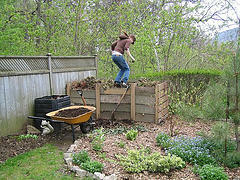 The compost bin will also last for a long time, and can be a lot more aesthetically pleasing. In addition, compost bins can at times yield quicker compost, and if you have a smaller yard or are working with a smaller need for compost, they are absolutely perfect. So, when you take these points into consideration, a compost bin might be a lot more practical and effective for your home than a compost heap. Categories // How To Compost Tags // Add new tag, Compost Bin, Compost Heap, Cons, Heap of greatness, Pros, Which is right for me?